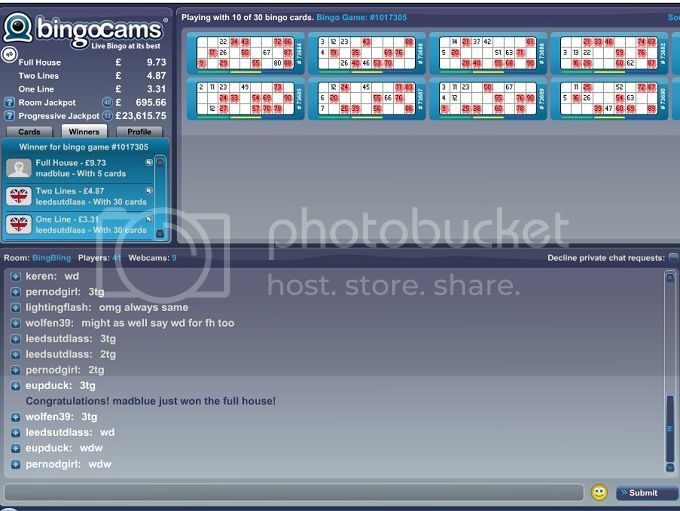 I was going through the mental list of bingo sites that I belong to and I realized that it has been a while since I played at one unique site. Bingo Cams is probably missing me and I should get back for a game or two. I don't even care if I win when I play there. I know that's crazy but the experience is so much fun. I logged in and went straight to the bingo but not before I checked out some of the live win moments. These players know how to get a laugh from the crowd. I bought a few tickets for a game that had a decent prize. I love watching the chat mods and some of the live wins. That's what sets this site apart from others; it's the unique webcam functionality. I couldn't win to save my life. Annoyed, I stayed around for one more game with my last bit of money. I only bought 8 cards with my 40 pence but if it was meant for me to win I would. My game began and I was one number from the line win pretty quickly. Just as I began to wait for it someone took the prize. I was down to 2tg for the two line prize of £4.87 but the same winner took that as well. Two calls later the house was won and not by me. What was I thinking when I said I didn't care if I won? I'll be back to Bingo Cams eventually for my revenge!